2. The Larrabee family was very wealthy. A townhouse given to them as a wedding gift had been converted into ______. 3. Linus, the eldest Larrabee, was given this superlative by his Yale classmates. "classmate with the handsomest brother"
"most likely to work himself to death"
"most likely to never crack a smile"
"most likely to leave his alma mater $50 million"
4. David Larrabee sneaks away from the party, along with his date. Where do they meet up? 5. Sabrina gets ready to head to Paris. What's she going to be doing in France? 6. A lovesick Sabrina decides to end her life. What instructions does she leave for her father in the suicide note? "PS: Don't have David at the funeral. He probably wouldn't even cry." 7. Sabrina starts every car in the garage and waits for the end. Who winds up inadvertently saving her? 8. Sabrina heads off to Paris and finds that culinary school is going to be harder than she anticipated. Why? 9. Sabrina's cooking ability improves after this happens. 10. David's upset to read news of his engagement - especially as he hasn't proposed to anyone. He learns Linus planted the news, as it's part of a business deal. The family David will marry into owns a company that produces ______. 11. What is being made with the sugar cane that's part of the Tyson/Larrabee business deal? 12. 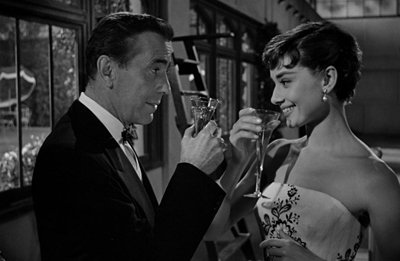 2 years after heading to Paris, Sabrina arrives home. She enjoys a ride home from David, partly because this happens. 13. David's plan to spend some alone time with Sabrina at the indoor tennis court fails when this happens. 14. Linus shows up at the tennis court with champagne instead of his brother. Linus is proud of Sabrina when she does this. 15. Sabrina notes when the band plays a certain song, as it's the song David dances to with all of his dates. Linus takes the opportunity to dance with her instead. What's the song? 16. While trying to "woo" Sabrina as a distraction, Linus tells her father about his plan to do this. 17. Sabrina is both happy and sad to hear this news from Linus. She has no idea the news he shares is a lie. 18. Sabrina and Linus arrive home from a night out to find David waiting outside for her. He's healing up and feeling better. What does Sabrina ask David to do? 19. Sabrina tries to avoid another date with Linus, but he comes and gets her from the Larrabee Building phone booth. What does Sabrina do while she's in Linus's office/the boardroom? 20. Sabrina finds the boat tickets to Paris while she's looking for this item. 21. Feeling bad about his deception - and Sabrina's hurt feelings as a result - Linus does this. 22. David finally makes an appearance in the boardroom and does this. Davis realized the kiss he got from Sabrina the night before was a "goodbye kiss"
23. The ship to Paris has already sailed. How does Linus get onto the boat? 24. David and Linus's father, sick of the shenanigans, calls the business meeting to order. What happens next? 25. How does Sabrina figure out that Linus is on the ship?